In 1999, the Virginia Tech’s women’s lacrosse team won 11 games. 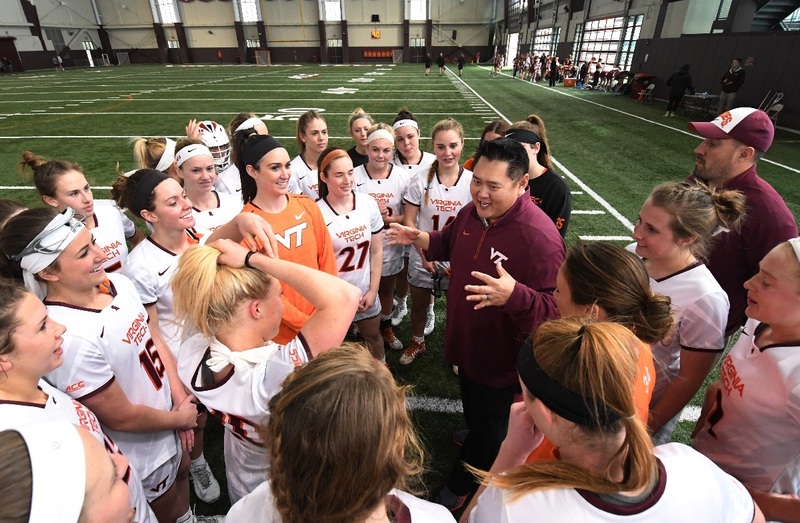 That was the most wins in program history until Head Coach John Sung arrived on campus. The Hokies won 11 games in his first season in 2017, tying the program record. Last season he led the team to 14 wins and their first ever NCAA tournament appearance. The lacrosse program has quickly developed into one of the more promising teams at Virginia Tech in just two years. The Hokies open up the season as the 11th-ranked team in the nation, according to the Inside Lacrosse poll. This ranking demonstrates the continuity the team had this offseason, as seven of the top nine players in points from last year are returning. This team is very similar to the team that made the second round of the NCAA Tournament last season. In many sports, making it into the NCAA Tournament isn’t always an indicator of an elite program. However, in women’s lacrosse there are only 26 bids, with 13 of them being automatic bids for conference champions. Making the tournament last season was a fantastic achievement for a program that won five games just three seasons ago. The Hokies won’t have an easy road back to the tournament. The team plays eight games against teams ranked in the preseason top-20, and two other games against teams who received votes in the poll. These include games against three of the top four teams in the country as well. Virginia Tech will have one of the toughest schedules in the country this year, but despite the difficulty, it will help them to build a resume. A large reason the Hokies were so successful last year was the breakout performance of freshman midfielder Paige Petty. Petty scored 58 goals, which was good for sixth in the ACC last year. This achievement led to her being named a first-team All-ACC player and a second team All-American. This team has a lot of young faces and some experienced veterans that make them a threat to make a deep postseason run. The Hokies may have a tough road ahead, but they will be working hard to continue their success and go further than they were able to last season. Well written and insightful. I’m really enjoying the coverage of non-revenue sports. It would be ironic if the women’s lacrosse program brought Tech its first NCAA team championship considering it was the worst athletic program at Tech for 2 decades. I believe that it can happen as long as we can hang on to John Sung.